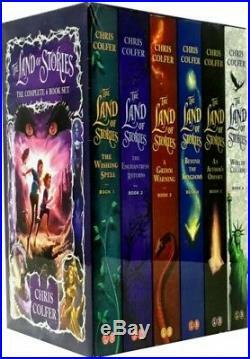 The Land of Stories Chirs Colfer Collection 6 Books Set. Alex and Conner Bailey's world is about to change. When the twins' grandmother gives them a treasured fairy-tale book, they have no idea they're about to enter a land beyond all imagining: the Land of Stories, where fairy tales are real. But as Alex and Conner soon discover, the stories they know so well haven't ended in this magical land - Goldilocks is now a wanted fugitive, Red Riding Hood has her own kingdom, and Queen Cinderella is about to become a mother! The twins know they must get back home somehow. But with the legendary Evil Queen hot on their trail, will they ever find the way? The Land of Stories: The Wishing Spell brings readers on a thrilling quest filled with magic spells, laugh-out-loud humour and page-turning adventure. Alex and Conner Bailey have not been back to the magical Land of Stories since their adventures in The Wishing Spell ended. But one night, they learn the famed Enchantress has kidnapped their mother. Against the will of their grandmother (the one and only Fairy Godmother), the twins must find their own way into the Land of Stories to rescue their mother and save the fairy tale world from the greatest threat it's ever faced A Grimm Warning. Conner Bailey thinks his fairy-tale adventures are behind him - until he discovers a mysterious clue left by the famous Brothers Grimm. With help from his classmate Bree and the outlandish Mother Goose, Conner sets off on a mission across Europe to crack a two-hundred-year-old code. Meanwhile, Alex Bailey is training to become the next Fairy Godmother. But her attempts at granting wishes never go as planned. Will she ever be truly ready to lead the Fairy Council? When all signs point to disaster for the Land of Stories, Conner and Alex must join forces with their friends and enemies to save the day. But nothing can prepare them for the coming battle. Or for the secret that will change the twins' lives forever. The third book in the bestselling Land of Stories series puts the twins to the test as they must bring two worlds together! Fairy tales are just the beginning. The Masked Man is on the loose in the Land of Stories, and it's up to Alex and Conner Bailey to stop him. Except Alex has been thrown off the Fairy Council, and no one will believe they're in danger. With only the help of the ragtag group of Goldilocks, Jack, Red Riding Hood, and Mother Goose and her gander, Lester, the Bailey twins discover the Masked Man's secret scheme: he possesses a powerful magic potion that turns every book it touches into a portal, and he is recruiting an army of literature's greatest villains! So begins a race through the magical Land of Oz, the fantastical world of Neverland, the madness of Wonderland, and beyond. Can Alex and Conner catch up to the Masked Man, or will they be one step behind until it's too late? Fairy tales and classic stories collide in the fourth adventure in the bestselling Land of Stories series as the twins travel beyond the kingdoms. The 5th book in the No. 1 New York Times bestselling series by Chris Colfer In the highly anticipated continuation of the Land of Stories series, Conner learns that the only place to fight the Masked Man's literary army is inside his own short stories When the twins and their friends enter worlds crafted from Conner's imagination, finding allies no one else could have ever dreamed of, the race begins to put an end to the Masked Man's reign of terror. Can the twins finally restore peace in the fairy tale world. The epic conclusion to Chris Colfer's No. 1 New York Times bestselling series The Land of Stories In the highly anticipated finale, Conner and Alex must brave the impossible. All of the Land of Stories fairy tale characters - heroes and villains - are no longer confined within their world With mayhem brewing in the Big Apple, Conner and Alex will have to win their biggest battle yet. Can the twins restore order between the human and fairy-tale world Breathtaking action mixed with laugh-out-loud moments and lots of heart will make this a gripping conclusion for fans old and new. We are dedicated to ensuring the highest possible quality service to our customers. You can send us a message by using the "Questions and answers" section towards the bottom of the page. 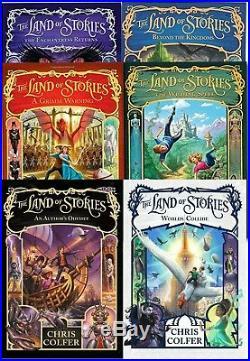 The item "Chris Colfer Land of Stories Collection 6 Books Box Set Pack Beyond the Kingdom" is in sale since Wednesday, September 12, 2018. This item is in the category "Books, Comics & Magazines\Children's & Young Adults\Fiction\Children's Fiction". The seller is "snazal-bargain" and is located in Leicester. This item can be shipped to North, South, or Latin America, all countries in Europe, all countries in continental Asia, Australia.